Bengkung is a traditional Malaysian belly binding method. Essentially it is a practice of tying a long strip of cloth around the abdomen during the postpartum recovery period to ensure a strong support to our womb after childbirth. -Pulls in the separated abdominal muscles (diastasis recti) back together. -Decreases postpartum bleeding time by speeding up the process of getting rid of waste blood in a natural way. It’s the length. 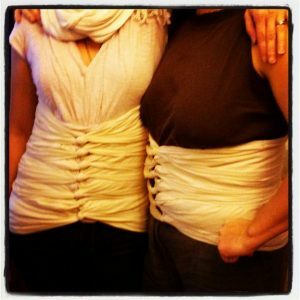 A Bengkung Belly Bind is a long wrap that covers from under the chest all the way down to below the hips. The difference between this and a girdle is this binds you and can contour your body perfectly whereas the ones you purchase are “one size fits all”.